As we enter the New Year, let’s make 2015 a year of exploring the many gifts from skilled researchers and clinicians which can support our resolution to live better. The participants of the Mindfulness-Based Symptom Management, Burnout Resilience and Pain Management programs at the Ottawa Mindfulness Clinic have one wish in common: a desire to find a way to live their lives differently. In fact, this wish is not only that of the participants but also of everyone who works at the OMC. We share together the realization that despite our best intentions, we falter in caring for ourselves and others in a way that is kind, nourishing and supportive. We have strong values and tend to be committed to making ethically informed choices and yet we find ourselves wondering where all the wisdom went as we choose against those exact purposes. If you’ve taken a mindfulness course, good start! You know over eight classes there can be shifts in your thoughts, actions and speech. You also know it’s not a quick fix and that the Ninth Class is the toughest! So to help with the rest of your practice life, here’s a collection of books that we recommend to support, boost and sustain your practice! 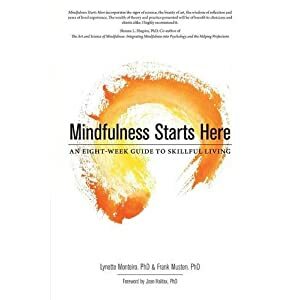 Mindfulness Starts Here: An eight-week guide to skillful living by Lynette Monteiro & Frank Musten. Now you didn’t think I would miss a chance to prop up our own book? If you’ve taken the 8-week program at the OMC, this is a great way to extend your practice. It also helps to come to the monthly Alumni groups! Nuff said. Let’s get on to the books you really need to get for yourself! Leaves Falling Gently: Living fully with serious life-limiting illness through mindfulness, compassion & connectedness by Susan Bauer-Wu. This is likely my all-time favourite. Bauer-Wu is an expert in the field of pain, oncology and mindfulness. The book is infused with compassion and an open-hearted approach to the vagaries of chronic pain. The exercises are easy and helpful, realistic and encouraging. The sections on the impact of chronic illness on memory, attention, emotions, etc. is invaluable. This book also is unstinting in its honesty about life-threatening illness and offers opportunities to change our rigid stance to the reality of living and dying. The Practicing Happiness Workbook by Ruth Baer. This is a terrific book that brings together Dr. Baer’s skills as a clinician, methodical approach as a researcher and clear understanding as a mindfulness practitioner. I loved the set-up of the workbook because it … well, it works. Start with a nice pithy overview and then jump in at your own pace. The second section explores four very important traps that can derail our practice: rumination, avoidance, emotion-driven behaviours and self-criticism. The section following on mindfulness skills is clearly written and I truly appreciate the inclusion of values and goals. The chapters are punctuated with stories about people with whom we can identify and the worksheets are very user-friendly. It makes me happy just to read it! Hardwiring Happiness: The new brain science of contentment, calm, and confidence by Rick Hanson. Neuropsychologist Rick Hanson is well-known for his ability to pull together neuroscience and psychological mind states in a way that is immanently understandable by most of us non-neuroscientists. There are so many catch phrases used in the mindfulness circles that originate with his teachings and in his books! Velcro for bad/Teflon for good, HEAL yourself, metaphors for resilience and vulnerability, the list is endless. What is important though is his ability to explain why we act the way do and how this is hard-wired. The section “Paper Tiger Paranoia” is my favourite and has helped me out of many a flight reaction! Mostly, in this book, we get to practice the ways in which to make changes to those survival instincts and hard-wire responses to experiences that sustain and help us. If you find this book helpful (or if you’re curious), also try his new program called Foundations of Well-Being which is a year-long on-line program and worth taking. Living Well with Pain & Illness: The mindful way to free yourself from suffering by Vidyamala Burch. This book is written by and is based on the Breathworks program developed by someone who truly understands the challenge of physical pain. Vidyamala Burch’s history is unlike anyone I’ve read about and her strength is apparent throughout the book. Chapter 2 explains what is pain and is one of the clearest and most useful descriptions available. The use of research-based information is well-placed and does not overwhelm the information in each chapter. I totally fell in love with the third chapter. It’s my favourite allegory of how we create our suffering out of pain. And Burch patiently tells the story in gentle sequences making it come alive. The exercises and case stories are accessible and very user-friendly. I prefer the book to the e-book simply because the text set up is more compelling. Empathy: Why it matters and how to get it by Roman Krznaric. This is an important book to keep the practice of mindfulness from becoming a self-centered practice. While we start our practice because we suffer the effects of personal difficulties, it is important to see that we are created, and can be undone, in a social context of family, community and global events. Mindfulness brings our awareness to our suffering and we practice so that we don’t repeat the same cycles of interactions with ourselves and others. However the deeper intention of mindfulness is to create a compassionate world and that change can’t happen without seeing that others too want to be free of the same suffering we endure. Empathy is the capacity to walk in their shoes, to make choices that are informed by understanding that what others need is not what we think they need. The exercises and examples in the book are wonderful and challenge us to find a different way to know the world. Grow your connection with those you love and beyond! Mindful Compassion by Paul Gilbert & Choden. Paul Gilbert is well-known and respected for his work on compassion and cultivating the compassionate mind. In this book, he teams with Choden, a Buddhist monk who helped develop the graduate program in mindfulness and compassion at Aberdeen University. I particularly like the way they organize the book so that the arising of compassion is a natural outcome of how we organize the world as we know it. Gilbert’s perspective of compassion as a social mentality which helps us negotiate through relationships and interactions is an important understanding. In other words, being compassionate is far from being soft and squidgy or a door mat. The exercises are nicely explained and inviting. The definitions of compassion clear up misconceptions. The development of a compassionate self (Chapter 10) is probably the most important part of the book. However, it rests on all that precedes it; I especially liked that the exercises in this chapter are also empathy cultivating ones. An important addition to your mindfulness practice! The Mindful Way Workbook: An 8-week program to free yourself from depression and emotional distress by John Teasdale, Mark Williams & Zindel Segal. This book is a user-format version of the previously published A Mindful Way through Depression. The first section lays out the foundations and the next section takes us through the eight weeks. I liked how the issue of traps and obstacles is re-framed as “another way of knowing” which opens up the thought patterns and is subtly a practice in cognitive flexibility. It is focused on addressing depression through mindfulness however, the various exercises also might be useful for anxiety and general stress. I had trouble with the layout of the book (too many boxes for a book that wants us to get out of our mental boxes) and the excessive number of balloon quotes are distracting (not cool for a mindfulness book). I have used it as a guidebook with individual patients and found it organizes the sessions well. Be patient when you use this but do try it! The Mindful Path to Self-Compassion: Freeing yourself from destructive thoughts and emotions by Christopher Germer AND Self-Compassion: The proven power of being kind to yourself by Kristin Neff. These two books come as a perfectly balanced pair. Germer approaches self-compassion with a clinical understanding of the emotional impact of our often harsh inner critic. Neff comes from the perspective of a research-based understanding of what self-compassion means and how it works. With both the experiential practice and the knowledge base to ground it, I find the practice of self-compassion inviting and easy to integrate into my life. As both Neff and Germer remind us in their workshops: don’t chose a practice that sets off an argument in your mind about it. Folded into both books is also the much-needed practice of forgiving ourselves for not being that superhuman being we think we need to be. The Mindful Way to Study: Dancing with your books by Jake Gibbs & Roddy Gibbs. For all you students out there and those of us who are perennial students, this is a terrific guide to setting down and getting the work done. And more. I like the way this book addresses the various obstacles we encounter (traps) by setting the perspective of “gumption”. Just do what needs to be done! Well, it’s not that easy and Gibbs & Gibbs walk us through a number of gumption traps. The first one was ego (but I figure I already know how that works so I skipped it… no, not really). Check out the section on procrastination though; it’s not just about boredom or priorities! Gibbs & Gibbs’ focus on Right Effort (the last section) is helpful and has a nice balance of meditative practice with insight to our actions.